Golnar Adili, Embrace, 2013, digital print, vellum, graph paper, graphite, 11 x 17". Are there hidden messages in the handwritten letters of the dead? Perhaps one can find them at those interstitial points between vowels. Golnar Adili’s work speaks to loss and memory through a personal archive of family documents that she came across after her father—an Iranian intellectual forced into exile after the 1979 revolution—passed away. In Eleven-Page Letter, 2016, the artist covers her father’s epistolary correspondences with sheets of vellum, cutting out small windows to reveal the Persian vowel “ye,” a letter that curves up to form what looks like an empty embrace. “Edits,” “freedom,” “food,” “separation”—Adili records English translations of his words as well. To see them written in different languages by two different members of the same family is to look at pieces of a larger puzzle woven across time and generations—the continuation of a narrative only few are privy to via the palimpsest created by the vellum’s semi-opacity. 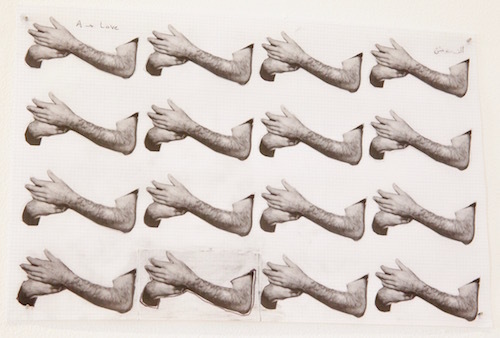 On the opposing wall, collages such as Embrace and Concentration, both 2013, utilize pictures of Adili’s father’s arms, taken from old photographs. Her patterned arrangements of these fragments manage to create a rich and mysterious visual alphabet. This exhibition is more than just an homage—indeed, it is an affectionate familial portrait. But it is also a careful study of the body as an extension of language. The longing here is palpable, and much of what is said transcends the written word.